Poster featuring an illustration of a young woman whose headscarf has slipped down onto her shoulders, holding out her hands to the viewer. 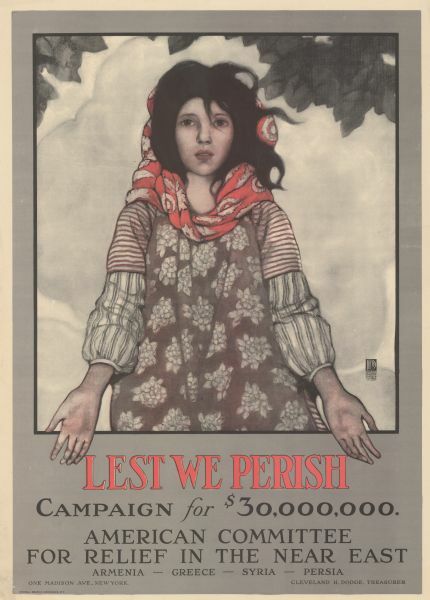 Poster text reads: "Lest We Perish. Campaign for $30,000,000. American Committee for Relief in the Near East. Armenia — Greece — Syria — Persia. One Madison Ave., New York. Cleveland H. Dodge, Treasurer." Illustration by Ethel Franklin Betts. Conwell Graphic Companies. N.Y. Includes the the Division of Pictorial Publicity (DPP) logo and text: "Committee on Public Information Division of Pictorial Publicity."